This 11 in 1 Wallet survival tool by Explore Mate has a slim design that allows it to easily fit into a wallet or money clip, and doesn’t take up any more space than a credit card. The wallet survival tool has a lot of gadgets like a bottle opener, cutting edge, ruler, saw blade, can opener, and key chain hole. If you’re looking for the best wallet survival card tool this one from explore mate is great. 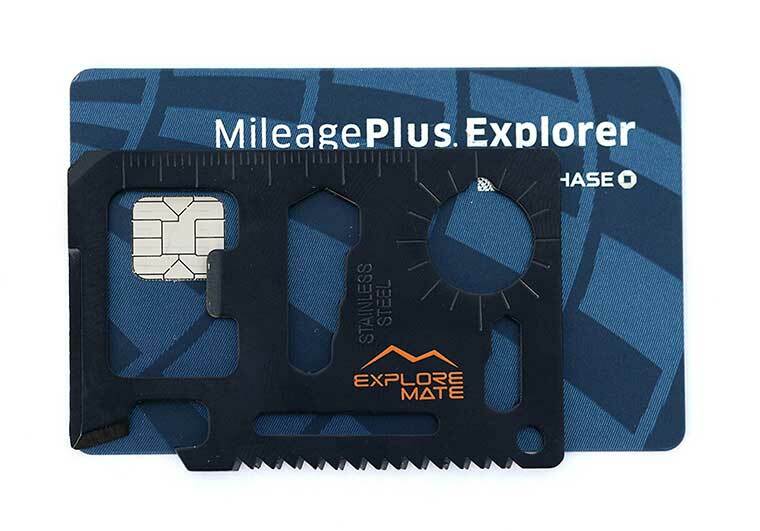 Along with being made from high quality aluminium, it also has has 11 unique features and fits perfectly into most standard sized wallet slots (see image of size compared to a standard credit card below). It has 11 useful tools for different situations, including a bottle opener, flat screwdriver, and can opener. There are also a few cool tools i didn’t expect it to have like a flat head screwdriver like corner and a can opener (makes it especially handy for people who open bottles or drink). Here is a video of a wallet survival tool in action. You can see how they function in the video, but the black one by Explore Mate you see in the rest of the photos is better. 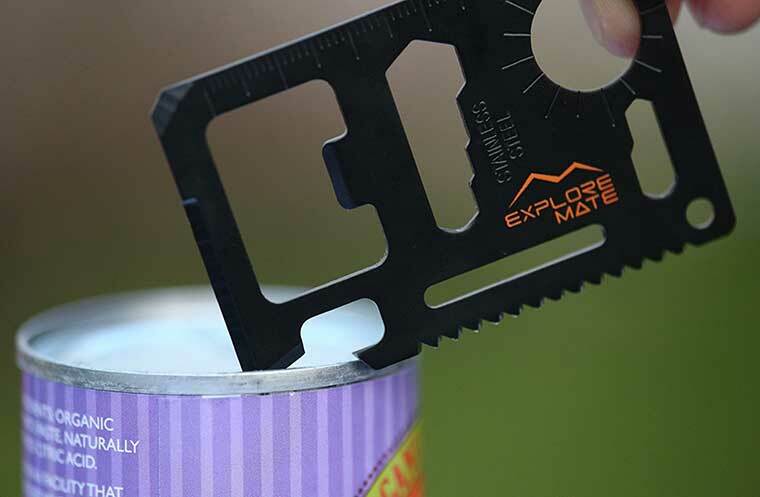 It’s handy for more than just survival situations, it is also great for those occasions when you just can’t find the can opener or a razor to open a box or letter. 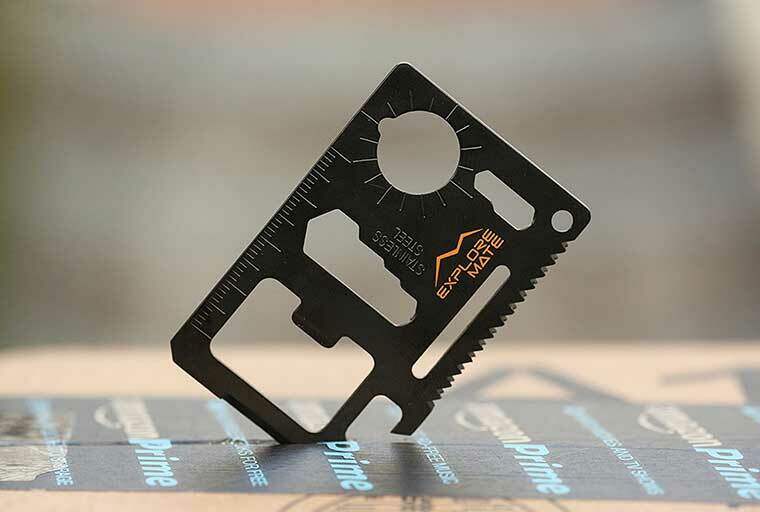 With a wallet survival tool you won’t have to try to pick the corners of the box and you’ll always have a ruler, knife, and box opener. This image gives you a good perspective of the size of the tool. The Explore Mate company makes a few different designs, and they also sell this product in stainless steel (it is considerably cheaper). You can see them all through the orange link at the top of the page. If you have any questions about this product leave them below.